with special guest, Maryrose Crook. Coming up this week at Al's Bar is a visiting performance poet, or rather a long lost daughter of Aotearoa returning. We thought y'all should get along and check it out. It's not every week we have a touring poet of this calibre so come along and support! Sandra Sarala. a.k.a. 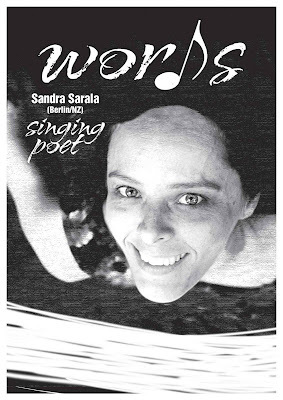 Sandra Dempster, left New Zealand 13 years ago for Seoul and ended up in Berlin, where she's been active in the city's vibrant international community as a singing poet with a sideline in archaic East European folk song for the last eight years. Her poetic performances are lyrical, satiric, philosophic and story-telling: after studying history from 1989-91 at the University of Canterbury and theatre and film at Victoria University of Wellington in 1996 she was a member of Red Mole's Roadwork's company, she has devised and performed her own work in Wellington, South Korea, Poland and Germany, trained in Commedia dell'Arte in Italy, and developed open vocal technique with teachers from Ukraine, Russia, and Poland. She's survived several economic meltdowns in various countries, including South Korea, Russia, Poland, the Czech Republic and Germany, and has fallen back on farming, journalism, life-modelling and teaching skills in most of those places. After spending a winter writing, alone on an isolated central Bohemian farm with wood-stove heating/cooking and no running water, she fell in love with the luxuries of Berlin in spring 2002 and moved there, later becoming a co-founding member of the ensemble Polynushka, whose 2008 limited release CD of Russian village song won the German Record Critic's prize for folklore in August of the same year. Having been born and raised and Dunedin then steadily making her way north through Christchurch, Wellington, Paekakariki, Asia and Europe, she's touring her way back south during March 2010 before returning to Berlin after Easter. We have a sister poetry open mic in Wanaka! Check out their blog via the link above or here. Catalyst's March night was honoured to have Liz in attendance and over several drinks we started to cook up schemes to bring our two esteemed literary salon evenings together. Let us know what you think of that idea and what we could do together!